In 2373, Kalenna participated in an escape from the Dominion's Internment Camp 371 with Julian Bashir, Elim Garak, Martok and Worf. These events were documented in the Deep Space 9 episode By Inferno's Light. 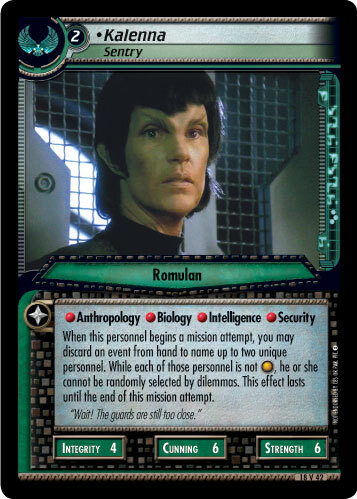 In the Star Trek CCG, Kalenna helps two personnel avoid random selections. That's sort of like escaping from prison, isn't it? That's enough of the Siskoid-esque review. Let's move on to gameplay. Even without her ability, Kalenna would make a worthy addition to many Romulan decks. For only two cost, she provides solid attributes of four Integrity, six Cunning and six Strength. She also has a ship-staffing icon and four decent skills. Anthropology and Biology are not found on many other Romulan personnel, and Intelligence will come in handy when facing Rogue Borg Ambush. Her Security is always useful when facing dilemmas â€“ except for Full Security Alert and Murder Investigation. Those dilemmas shouldn't affect Kalenna though, because they both involve random selections, and she can avoid them. That is correct, you can name her as one of the two personnel who cannot be randomly selected by dilemmas. This way, she will always be around to protect one other personnel from random selections. Her ability also lasts until the end of the mission attempt, whether she is still involved in it or not. It doesn't matter if she is stopped, killed, or otherwise removed from the attempt; her ability keeps on protecting the second named personnel. The obvious application for Kalenna is to throw her into a Wariness deck alongside some other Romulan who has a cost of three or less. The less obvious choice, however, would be to use her in a Captain's Log deck. The Terix already has Sirol (Diplomatic Adversary) and Tomalak (Irate Commander) named as corresponding Commanders. Khan Noonien Singh (Bold Man) can command any unique ship he is aboard, and Martia (Duplicitous Chameloid) can gain one keyword â€“ such as Commander: Terix. â€“ from a personnel present with her. These four corresponding Commanders could then be joined by Charvanek (Neutral Zone Commander) who can exclude herself from random selections. All that remains is to add Kalenna and another unique personnel who Kalenna can protect, and you will have seven personnel who cannot be randomly selected by dilemmas. That should be enough to complete many missions! Final Thought: Kalennaâ€™s ability works for any personnel who is not Non-Aligned. Why not splash her into a Federation deck and use her ability to protect James T. Kirk â€“ whichever version you may be using? Have an opinion about this card? Post it here!